On Saturday April 24th, join GreenHomeNYC on a tour of the Gen. Colin Powell Apartments, a new green affordable residential coop building in The Bronx. We’re grateful to Les Bluestone and Blue Sea Development Company for hosting the tour. Come and hear about an array of green features, including an extensive green roof, high efficiency boilers, recycled and low impact materials, and more. Saturday April 24th, at 11am. 715 Fox Street, The Bronx. RSVP required. Spaces are limited, please sign up using the registration form below. The building is comprised of 50 affordable studio, one, two and three bedroom coop units with a green roof, rooftop terrace and a community facility space in a precast concrete and masonry structure. 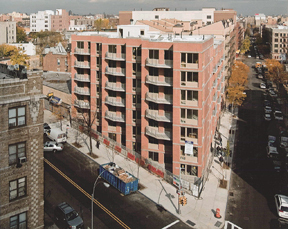 This project was awarded through a NYC HPD Cornerstone RFP and developed under the NYC Housing Development Corporation’s Affordable Coop Program with financial assistance from the NYS Affordable Housing Corporation, SONYMA, the Bronx Borough President and NYSERDA. The building is enrolled in NYSERDA’s Multifamily Performance Energy Star program and the USGBC’s LEED for Homes program. Read more about the Gen. Colin Powell Apartments in GreenHomeNYC’s green buildings directory.